For all broccoli lovers, here’s an interesting way to enjoy the vegetable as well as get the dramatic presentation effect. That whole head of broccoli situated like a colourful tree on a plate is sure to get attention. 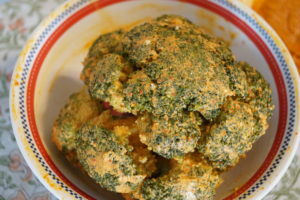 Broccoli is a vegetable many people don’t seem to like – certainly almost everyone in my family hates it – but as it is very healthy and full of nutrients, I thought trying to get creative with it might help. Alas, the kids….their broccoli rejection is so absolute, that they wouldn’t even consider liking it, however, two non-broccoli haters loved it! For people who do like broccoli however, this dish would be one to try. 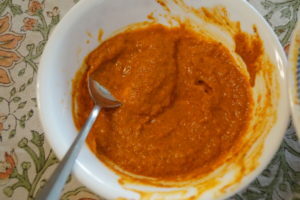 I’ve used my own piri piri sauce here which is really mild and tangy so if you’re using my recipe and want more heat, you can add some chilli flakes to it, or some chilli powder. This is a recipe even kids (who like the veg) can enjoy because of a lack of intense heat. If you’re using store bought piri piri (or peri peri) sauce, that would be more spicy, so you would need to gauge how much you want to add to your marinade. For someone like me who made every attempt to avoid most vegetables in my childhood, I’ve become a remarkable vegetable lover. A few bad health experiences because of unhealthy eating in my early 20s made me realise that what my parents have been harping on all my life about nutrition was so true – that there is no substitute for plenty of vegetables and fruit in your diet to remain a functioning healthy person. This a very very simple recipe, involves very few steps, is low calorie and is a vegetable-lover pleaser. You can serve it up for a lunch or dinner party. It is moist and full of flavour. 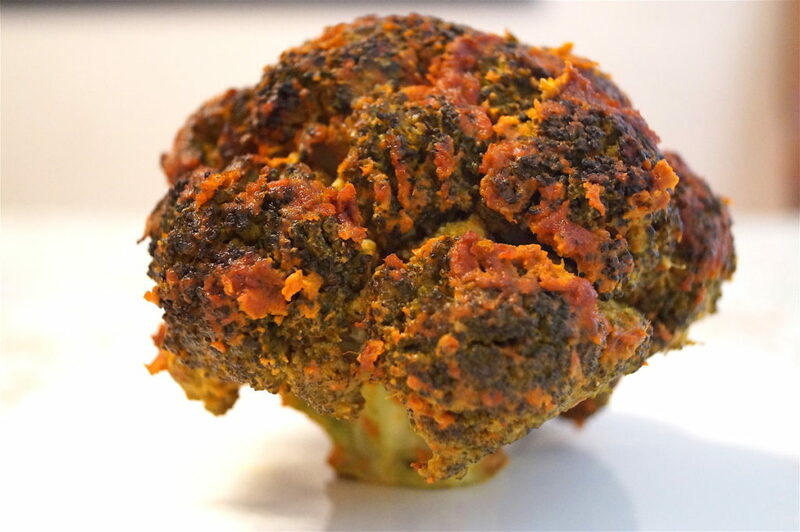 A few important things to remember – get young broccoli, not a very ripe one else you won’t get the crunch, blanch for only 1 minute in boiling water and no more and lastly bake on high heat for 25 to 30 minutes for the nice char grill. OVEN TIP: If you have a 28-litre or smaller oven, the baking time will be less. Mine’s a 35 litre oven. If you have a larger oven, the baking time may be more. This is something you have to be mindful about. In a large pot of boiling water, add 1 tablespoon of salt and then add the whole head of broccoli. Remove the broccoli from the pot after 1 minute and let it cool on a plate. Cut the stalk in an even straight line so the whole head can balance upright on a plate. Make sure the broccoli is young and not overripe else you won’t get the crunch and texture. In another bowl, mix the yoghurt with 3 tablespoons of piri piri sauce and 1/2 teaspoon salt, making sure all ingredients are blended nicely. Rub the marinade all over the broccoli making sure to go between each floret. Turn the broccoli upside down and rub the marinade into the florets from there. Once the entire head of broccoli is nicely coated, place it in a dish, cover with cling film and refrigerate for at least two hours, can even keep the whole day and even overnight. 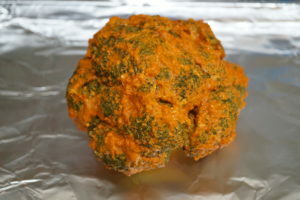 When ready to eat, remove the cling film, rub the remaining 3 tablespoons of piri piri sauce all over the broccoli inside and out and bake the broccoli in an upright position in a preheated 250°centigrade oven for 25 minutes with both top and bottom heating rods on. 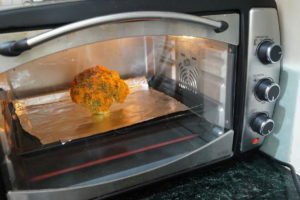 After 25 minutes shut off the oven and keep the broccoli inside for another 10 minutes if you want it drier. Else, remove and serve immediately. 4. bake in 250°C oven with top and bottom heating rods on for 25 minutes.